Brighton & Hove Albion winger Solly March admitted he thought it was 'game over' at Millwall on Sunday when he over-hit the free kick which led to the Seagulls' late equaliser. March's deep free kick was spilled into his own net by Millwall keeper David Martin which made the score 2-2 five minutes into injury-time and Albion went on to win 5-4 on penalties to reach the FA Cup semi-finals. March had made the first goal for Jurgen Locadia as Brighton scored twice in the closing stage to force extra-time and the winger was then on target in the penalty shoot-out. Talking about his late equaliser, March said: “I probably put a bit too much on it and I looked down and I thought the referee was going to blow his whistle. I didn’t know what happened and it was in the back of the net and everyone went mad. You take that and everyone was happy. "It was a fortunate goal. My first thought was that it was overhit and I thought, ‘that’s it, game over’, then I looked up and it was in the net. I didn’t know what happened at first. But you take a last-minute equaliser however they come and in the end we took into extra time, and probably should’ve won it then. But it was a tough game, they made it hard and to go through on penalties makes it more memorable." 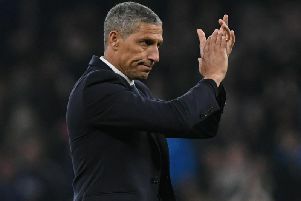 March praised Albion's character for coming back from 2-0 down to progress and said: “They make it tough, especially as it was an FA Cup quarter-final. They were very loud and have beaten a Premier League team already. We knew it would be tough and to come back from 2-0 down shows the character that we’ve got and shows that we can come back from anything really."